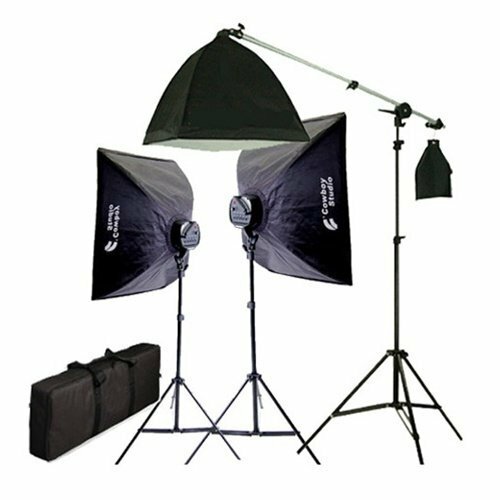 This kit is the perfect set up for web retailers or anyone wants to get a high quality videos and shots. It provides very higher power, total output is 2275 Watt continuous lighting. Lighting Stand: Black anodized aluminum backlight stand, Maximum height is 7 feet. Stable & Quick Setup. Photo Bulb: 45 watt fluorescent light bulb = 200 watt Incandescent light bulbs, color temperature 5000K, total output is 2000 Watt. These high-output daylight balanced compact fluorescent bulbs are ideally suited for digital photography. They also have very low heat so they don't get hot like the more common photo bulb choices. Light Socket: It mounts on standard light stands. You can control each of the light bulb on/off. Boom Kit:Solid quick release lever, fully adjustable. Max fully extended height is 7 feet with a 5/8" stem, 26" foot print, 42" min height, 40" when close, max load is 16 lb. Boom arm telescope extend to 5.6 ft. Screw on tip is 1/4".